We here at the American Treasure Tour blog like to share the wealth. With a nation rich in stories, we would be shortsighted to think there are no other places to visit besides just us - especially when we are only open for General Admission on Thursdays, Fridays and Saturdays (right now! ), and Group Tours by reservation the rest of the week. So what else can you do when you're in the neighborhood besides come to what Philadelphia Magazine awarded the Best Weird Museum of 2017? 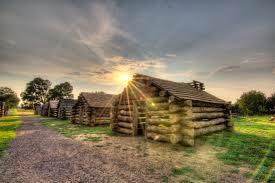 Go to Valley Forge National Historical Park, of course! Valley Forge NHP is where the Continental Army encamped from December 1777 through June 1778 during the Revolutionary War. Most of the famous military leaders were there - George Washington, Alexander Hamilton, Aaron Burr, to name just a few. No military conflicts with the British forces occurred at what is now protected land, but something just as significant did: a ragtag army was trained and unified under the authority of German immigrant Baron von Steuben. Want to learn more? Check out their website: https://www.nps.gov/vafo/index.htm or, better yet, visit! They are located just down the street from the American Treasure Tour.